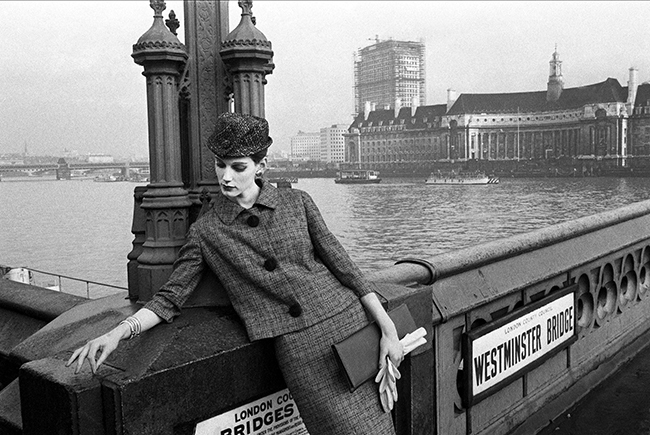 Duffy took this shot of Judy Dent for Vogue in 1961 on Westminster Bridge, London. The photograph is taken from the West side of the bridge near the bronze statue of Boadicea and Her Daughters opposite Big Ben. In the background, the County Hall can be seen at which time it was still home to the local government of London. In the distance, a high rise is being constructed overlooking Jubilee Gardens. This view over the model’s shoulder is now the exact location of the London Eye. Duffy studied dress design at St. Martins School of Art and was taught how to make and construct a garment. He understood the drape and fall of fabric and how the structure worked. Using this knowledge he always ensured the garment was shown on the model at it’s very best. Duffy was hired for his fashion photography by all the top fashion magazines of the period. Quote ref: E_462_01 if you require press information regarding this image.